Above is a screenshot of my desktop. Some of my desktop. I cropped four columns - forty icons - from the left-hand side. Apart from a handful of single-player games - in fact, all the single-player games I currently own - everything that remains is either an MMO, an MMO platform or an application related in some way to playing MMOs. The background is a screenshot from Guild Wars 2. 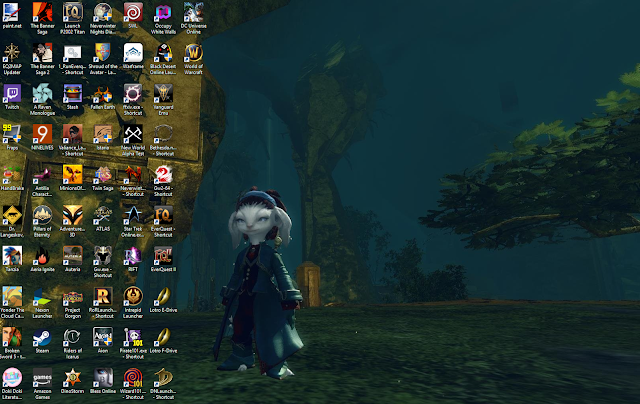 All my desktop backgrounds in living memory have been shots from MMOs. I have tens of thousands of them so there's plenty of choice. Obsession is such an ugly word. Then again, so is breezeblock. As I mentioned in some post or other a while back, I got a 2TB HDD for my birthday but I only got around to installing it after Christmas. That gave me three internal HDDs and four terabytes of onboard storage in total. This morning I hooked up an external HDD via a USB caddy and moved a bunch of MMOs across. Then I went through all three drives and made sure the icons for all those MMOs were present on the desktop. Well, I say I went through them. I mostly opened folders in a haphazard fashion and pulled out any launchers or executables that I happened to spot. I am no more organized in filing or ordering my games than I am in playing them. Still, I think I got most of what there was. This means I currently have thirty-eight MMOs, MMORPGs or limited tests for MMOs immediately available from the screen. Having an active icon on my desktop significantly increases the chances I will actually play any one of these. If I have to go find the game on an external disc, or even go digging around in the files on an internal drive, chances are I'll get distracted and end up doing something else entirely. That said, not all of those thirty-eight MMOs are playable right now. 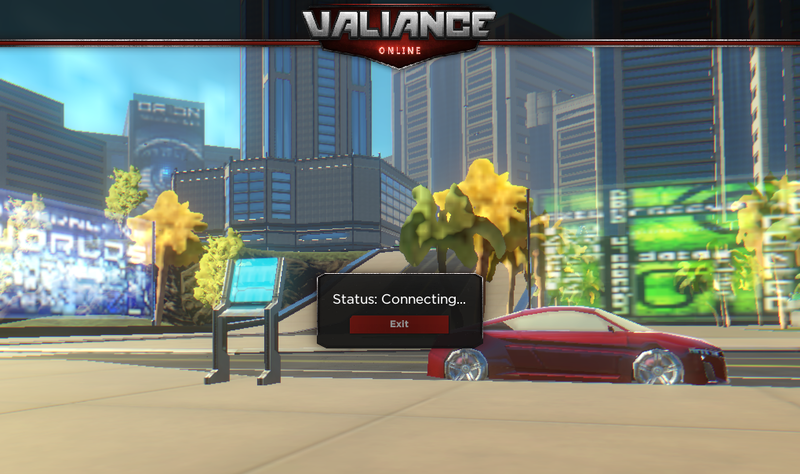 The icon for Valiance, for example, one of the numerous would-be successors to City of Heroes, used to go to some kind of tech demo or sneak peak. I don't think that's running any more. Hang on, I'll find out... no. it's not. As for Minions of Mirth, it used to be an MMO but now it's not. I'd forgotten all about until it got a mention on MassivelyOP a while back. The server hosting the MMO died but the offline single-player version still works. I patched it up today, made a new account and logged in to check. I never got very far in MoM the first (or second, or third) time around and I certainly don't plan on trying to get any further in single-player mode but I've confirmed it's there if I want it. Dino Storm I did used to enjoy playing. I might very well fancy another go. Is that one still running? It didn't work when I tried it a few minutes ago. I thought maybe it had finally died but nope! As it turns out, it's just not on Bigpoint any more. Not that I 'd remembered it was. Bigpoint decided to get out of the cowboy dinosaur business back in September last year but the game continues under the banner of Splitscreen Games. I just downloaded the new launcher from their website. It let me log in with my old username and my character was waiting for me just as I left him, what must now be several years ago. It never ceases to amaze me just how many MMOs there are and how long they last. Also how devotedly they retain our data even when we don't seem to have any more interest in using it. Dino Storm was fairly busy when last I played but there seemed to no-one but me around this time. 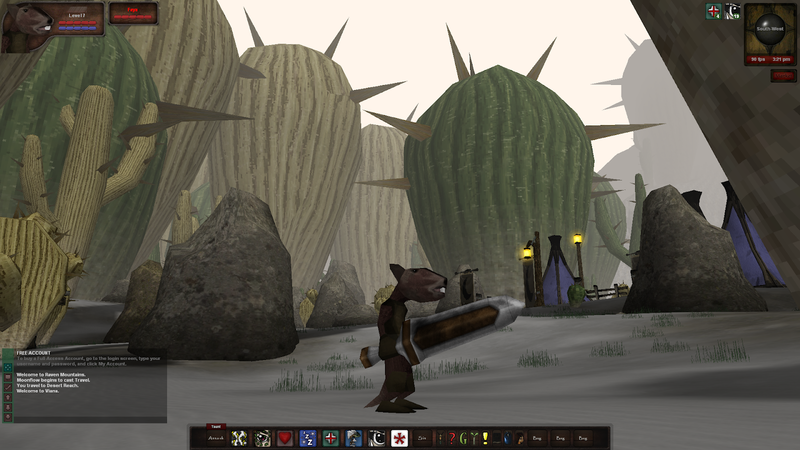 Auteria, an MMO in comparison with which Dino Storm is World of Warcraft, is also still plugging away. I just logged in and there it was. Why, and for whom? No idea. Speaking of obscure MMOs that no-one ever talks about, let alone plays, one that's not on the desktop screenshot above is The Hammers End. Actually, it is on the desktop now but I added it after I took the screenshot. I remembered it as I was writing this post si I went to see if it was still around. It is. The website has been smartened up somewhat. Not only that but the ludicrous payment model I balked at has been replaced with a straightforward F2P/Premium system. I downloaded the game and, yes, my old login still works and my character is still there. The main reason I started all of this wasn't to dig up obscure old titles and see how they're doing. It was to dig up big, successful titles I keep reading about and see how they're doing. The two I specifically would like to look at again are Elder Scrolls Online and Black Desert Online. There's always seem to be plenty of people willing to bang on about how no-one makes proper AAA MMORPGs any more and how the entire genre is doomed and yet there's these two, seemingly doing great business, both popular and successful. Not to mention Warframe. And FFXIV. Just off the top of my head. I don't think Warframe's ever going to be my sort of thing, mainly because the suits your character has to wear are so unremittingly hideous. I have never seen one single screenshot of the game where the player-character didn't look repulsive. I thought it might be different in the game itself but if anything it was worse. If Warframe's off the table for reasons of fashion, FFXIV certainly isn't. Characters there are a pleasure to look at. I might play some more of that, some day, seeing as how Square were kind enough to offer the first thirty or so levels for free. What I really want to do, though, is to visit my old house in BDO. The housing there doesn't get much of a mention but i thought it was pretty spiffy. and maybe see how much ESO has changed. I might also, finally, get back to Dragon Nest. That turned out to be another icon that didn't work. Dragon Nest has a convoluted history of ownership/publishing/regionalization that I could never keep straight but it seems whatever version I had installed isn't around any more. Dragon Nest Europe is still available via Steam, though, and I'm patching that up as I type. (Ed. It didn't work. Now I'm downloading it direct from the website). I also have the mobile version on Android. Supposedly it's cross-plattform now. If I could find my old log-in details I'd test that but I have a horrible feeling I might have to start again from scratch. Anyway, enough of this. I'm just hoping that having all these titles directly to hand, ready to fire up on a whim, might lead to me playing a wider variety of MMOs again. Of late I've been in something of a comfortable rut, doing dailies in GW2 and pottering about in EverQuest II. Very enjoyable it's been, too, but it wouldn't do me any harm to branch out a little. I am very definitely not going to follow the blogging trend and start setting myself goals or targets, let alone producing some kind of schedule. Heaven forfend! I am hoping, though, that merely seeing the icons in front of me each time I sit down at the keyboard might lead to a little meander across the MMO map. After all, there's so much out there I haven't seen. At least on EU all servers are bursting at the seams these days, so if the game’s popularity has declined I certainly don’t feel it. I don’t mean just the AFK folks in and around towns either. Wherever I go to bash some mobs there’s pretty much always someone already there, and I’m not even looking at the popular ‚endgame‘ grind spots because my gear isn’t advanced enough for those. I patched BDO up yesterday - it was a 36GB download on top of what I already had installed! That's several times the size of some fairly recent MMOs I have on my HDD. I had a run around for a while, re-familiarizing myself with my character and the game. I managed to find one of my houses, which was exactly as I'd left it well over a year ago - maybe two years, I forget just how long it's been since I last played. The housing in BDO is very good - should get more attention than it does, I think. Unfortunately my new download seems to have a fairly well-known bug. It's kind of game-breaking - my keyboard doesn't work. I had literally no controls at all at first. I had to manually reset WASD just to be able to move. I was able to assign some keys but most just won't work at all - I can't open Inventory with I for example and Ctrl doesn't free my cursor. I've tried all the suggested fixes and nothing has worked so far. If it comes to re-installing the entire game, which is the final option, I'm not sure I have the desire right now. Uh, that's bad. I hope it'll get sorted without a reinstall, it really does take long. The fashion of Warframe grows on you.. like a bioengineered tumor. I used to be extremely repeled by the completely weird organic look too. If you play it enough, you realize that no one else uses an art style like Warframe where everything is almost H. R. Gigeresque and they had serious nerve to pull such a unique aesthetic off. Having a more expanded color palette and some Prime or Market bought skins does help. I really did not like any of the starter warframe looks and still don’t. I know I was nearly repelled by everything at the start but keyed in on the Rhino frame and Palatine skin as something I could probably deal with. These days my appreciation of the aesthetic has expanded beyond that to quite a few other frames too, Oberon, Nidus, Chroma Prime, etc. I never liked H.R. Giger's art. Not at all my sort of thing. The rest of Warframe, or at least the small amount I saw when I tried it, was fine, it's really just the Player Character that's a problem. If I relaly liked the gameplay I'd probably be able to ignore it but I didn't really like that much, either, so I'm fairly certain it's not a game for me. FFXIV trial is playable only on accounts that never had full game, so you'd probably have to create new account for it. Yep, I did that back when they changed to the current system. That, to all intents and purposes, is my "Live" account now.